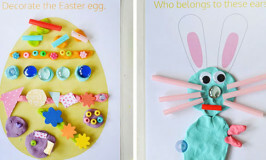 So you’ve seen our free printable people play dough mats right? Well my play dough mad kid is bored with making plain old people, he wants to make MONSTERS!!! So of course I did what any conscientious parent would do…I made him some. Noah and I came up with two monster heads, and two monster bodies. 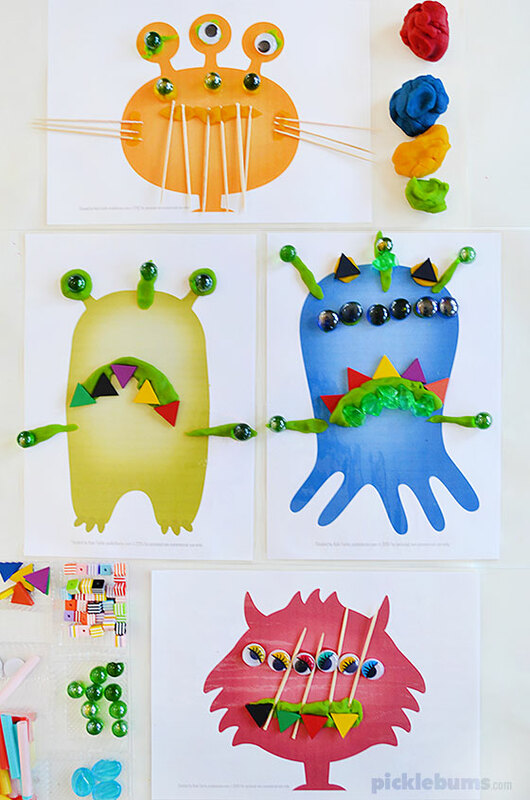 These monsters are a little bare though, they need some monstrous features added to them, so we collected some fun play dough accessories and went to work on our monsters! The red monster’s head is all spiky! He has horns and lots of eyes! 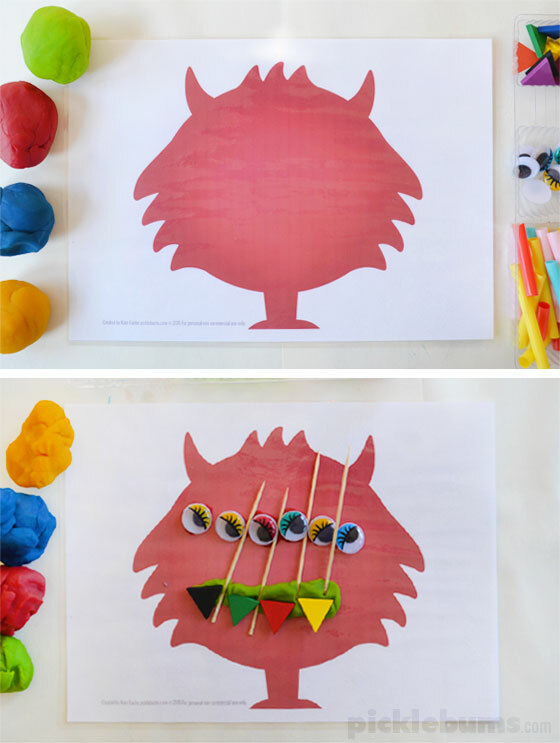 You can download the red monster play dough mat here. The yellow monster has three nostrils and lots of spikes coming out of its mouth! 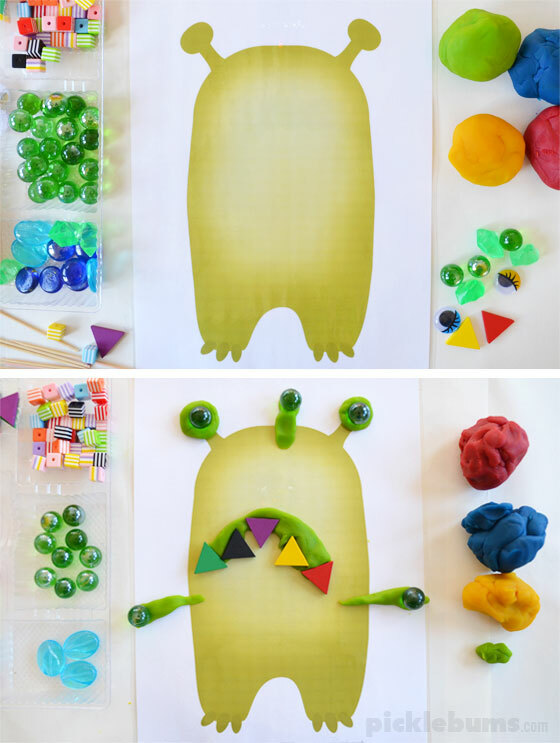 You can download the yellow monster play dough mat here. The green monster has very sharp, pointy teeth and eyeballs on its hands! The blue monster has tentacles for legs and a mean face! 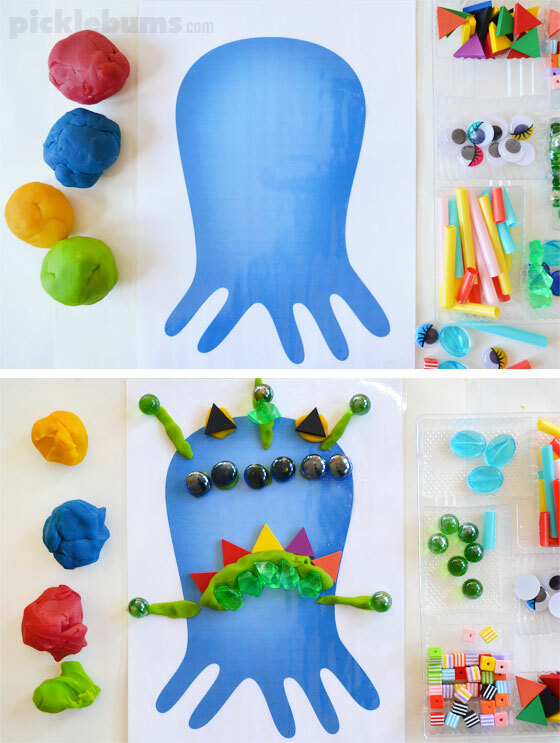 You can download the blue monster play dough mat here. 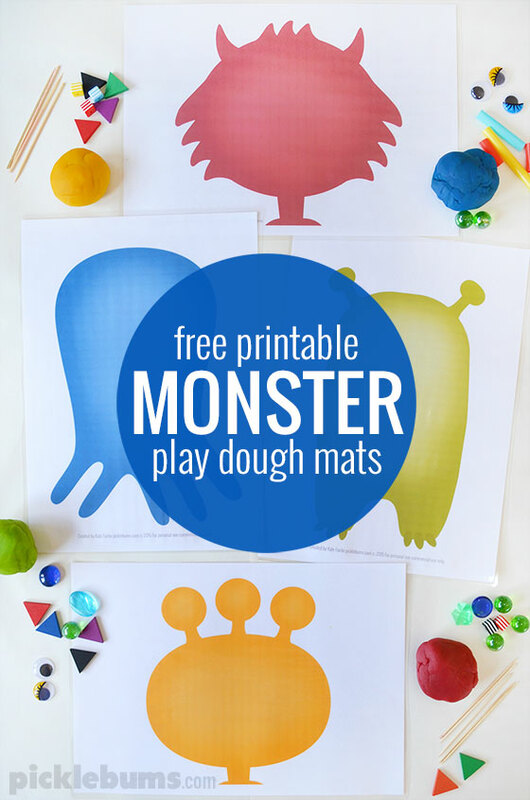 Each of these printable play dough mats is an A4 sized pdf file. If you are printing on US ‘letter sized’ paper be sure to select ‘fit’ or ‘shrink to fit’ from your printer options. Of course my five year old was right… monsters are way more fun than people! 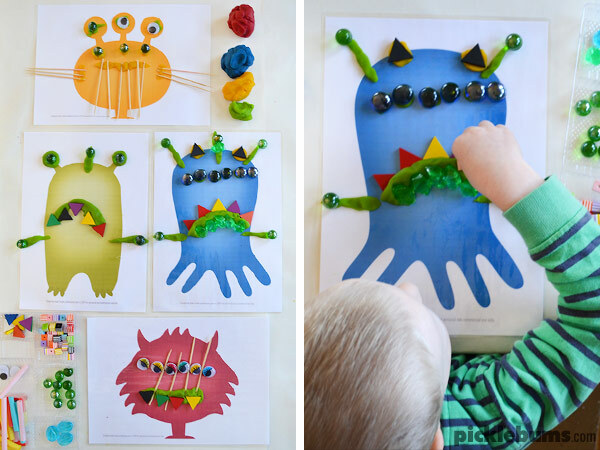 We had so much fun with these silly monsters, making up names for them, adding more and more eyeballs and even imagining what noises they might make. The play dough mats also work great with dry erase markers or crayons, or print them in black and white on plain paper and use them as drawing prompts. 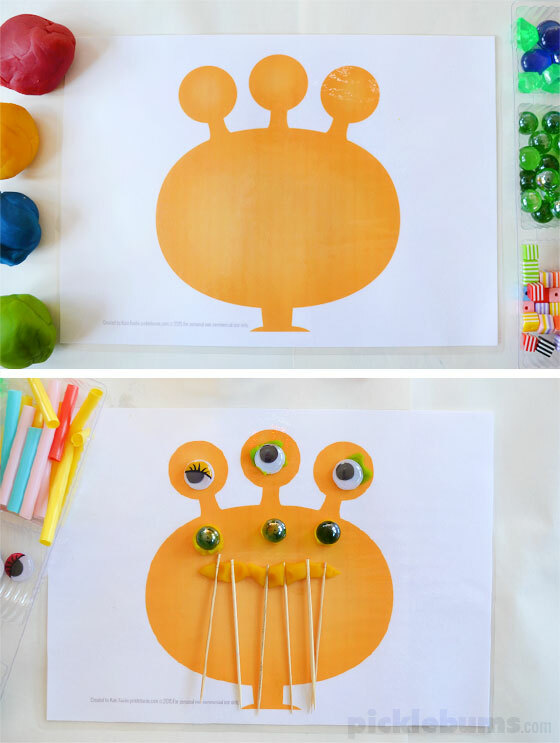 What will your play dough monsters look like? If you make some monsters, we’d love to see them! Tag me on instagram (@picklebums), or share a photo on our facebook page. Do your kids like monsters and fun spooky things? 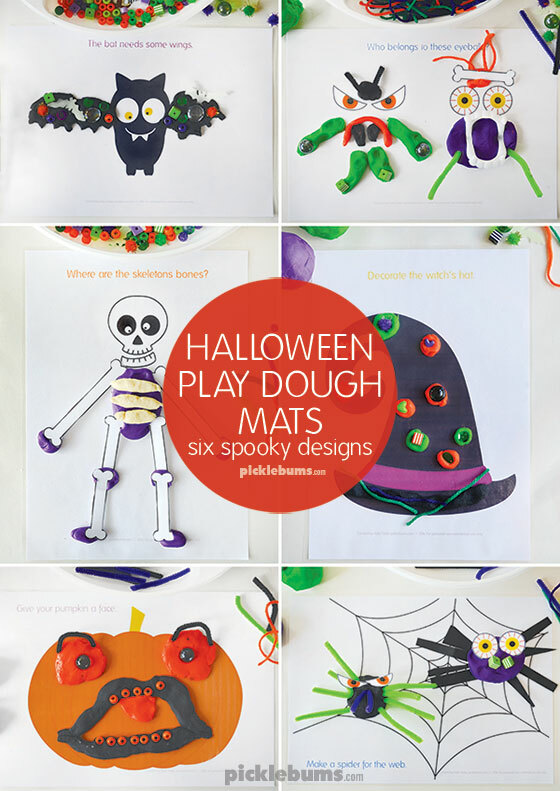 Check out our Halloween play dough mats! Your mats are adorable! The children in my care love using them. Thank you for sharing! Since you live play dough, what is your favorite play dough recipe? My kids loved this! 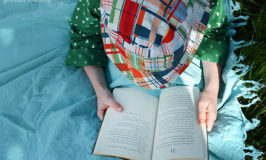 Thank you so much for posting a wonderful imaginative play activity!